Without the ball, there is no game. Balls differ in size, weight, and of course in design. You should chose the ball depending on the age of the player and the terrain, player’s experience is also a factor. According to the FIFA Certification Process, there are certain differences in casual, training and match footballs. Size is the main criterion for choosing a football. The size depends on the age of the player. The smallest players usually start playing with a ball in a size 3, which is suitable for footballers younger than 9 years old. Size 4 is the best choice for age category from 10 up to 13. Size 5 is the most common size type for young adults from 14 years old and for adults. Size 1 football is a special ball which is used for technical skills training. It is advisable to consult the size of your football with your trainer. A well-chosen football helps with proper ball control and can prevent potential joint problems. Don’t buy a size 5 ball for a young child – this may cause issues such as being too heavy, difficult to control, and your child may lose interest in football, because kicking the ball might be too difficult. Balls for natural and artificial grass with a classic durability are the most common ones. In a case of indoor football, players older than 14 may use a futsal ball, which is slightly heavier and has a dampened bounce. Younger players may play with a classic size 4 football. If you are planning on playing football in the sand, you should get a special beach ball. Streetball then requires a special football with higher resistance levels. How to tell a high-quality football? One indicator may of course be a higher price. Higher price = higher quality, technology, more durable materials, better properties. It doesn’t have to be true every time, but is it one of proven clues. Besides price, there are FIFA certifications. 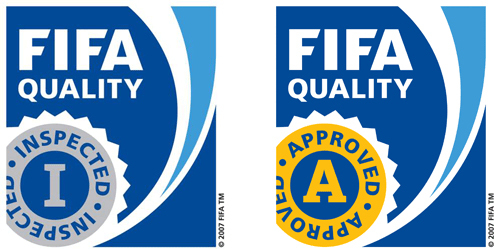 FIFA Inspected is a certificate awarded to balls which can be used in professional trainings. To receive this certificate, the football has to undergo six tests. One test more is required for FIFA Approved footballs, which is awarded only to balls for professional football matches such as football competitions, European Cups, European Championships, and World Cups.